TP-650 is designed to accommodate larger tablet computers including the 12.9" iPad Pro. Why struggle with expensive re-takes, on stage talent drifting off script or a presenters’ loss of eye contact with the viewing audience? 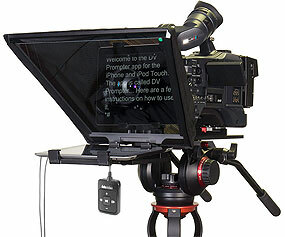 The Datavideo Prompter Kit, TP-650, is designed to help you overcome these problems by converting a tablet computer (not supplied) into a low cost and effective prompter. The Datavideo Prompter Kit TP-650 can be used in either a theatre setting, or a video studio. Prepared scripts or cue sheets can be easily copied and pasted into the DV prompter app software from email and scrolled at a set automatic rate or controlled by a user with the optional wired/wireless WR-500 remote for a more natural result. A number of clear fonts, colours and text sizes are available making reading comfortable from a variety of distances.